This charming Large Curio Console Cabinet with Rounded Sides is the perfect curio cabinet to spruce up your home decor. It is Amish made in your choice of a variety of hardwood options such as the beautiful cherry wood shown in the darker finish and the oak wood in the lighter finish. 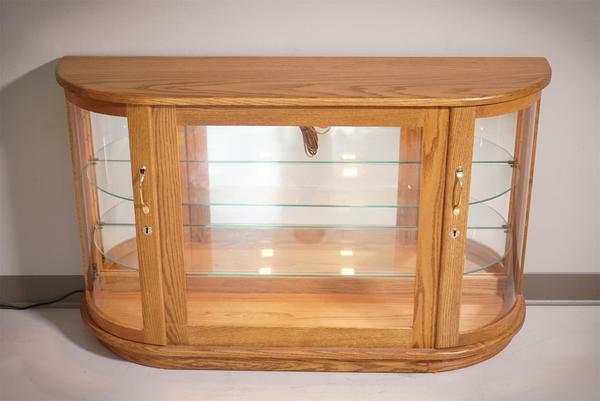 Customization is available on this Amish curio cabinet is you would like it to be wider, deeper or taller. If you would like custom dimensions or woods, please call one of our Amish furniture specialists today for a custom curio quote. You can also visit us at our Amish furniture store in Sarasota, Florida. It came today. That is the first beautiful thing I've seen in 2 weeks. Just wanted to tell you all thank you. It's perfect. Product is lovely, well made, well finished and years and years of collectibles and family treasures adorn its shelves. We're pleased we found DutchCrafters and would recommend their products to others.